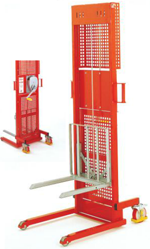 See below for our wide range of manual stackers available. These manual lifters are perfect for a wide variety of applications. 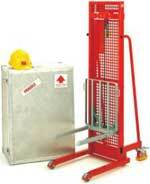 This hand winched general purpose lifter is perfect for a variety of applications. It has 2 possible capacities of 125kg to 200kg and three lift heights, up to 1220mm. The Midi range of general purpose lifters is ideal for many locations and uses, particularly where the 1500mm lift height is required. This lifter is fitted with rear castors and total stop brakes for full stability. 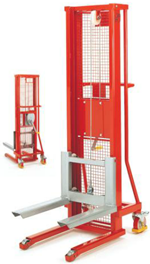 Our industrial winch stackers are manufactured from a fully welded channel and tube construction. Fixed weld mesh guarding fitted as standard. Steel straddle rollers 75mm diameter with roller bearing. Total stop brakes and foot protectors fitted as standard. Powder coated with an orange frame and grey forks and carriage. 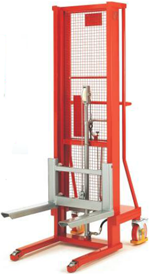 Our hydraulic hand pump stacker is built from approved hydraulic components for a long life with minimal maintenance. Fitted with overload valve and flow control on the return travel.